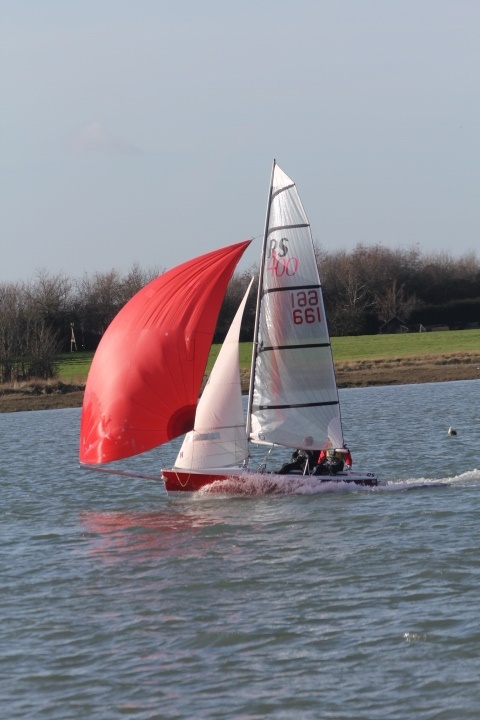 For the penultimate race day of the DQSC winter Frostbite series Race officer Graham Dalton set a simple triangle course in glorious sunshine to make the best of the North Westerly wind direction. As the fleet sailed down the harbour during the first race the wind backed, allowing the asymmetric boats to carry their spinnakers for the first part of the beat back up past the Quay. At the front of the fleet the RS400s exchanged the lead with some close racing until a gust caught one out, leading to the first capsize of the day. With the race shortened to two laps for the slower boats, the RS400s completed a third lap. With the results being calculated on average laps and then handicaps applied Warwick Hoddy and John Denyer in the 2000 were placed first, closely followed by Malcolm Buchanan in his Solo with the RS400s of Peter King/Jamie Prescott and Bob Marshall/Neil Bryant taking third and fourth places respectively. The second race saw the whole fleet complete three laps with the 400s leading on the water but dropping to 4th and 6th place, with Hoddy/Denyer being clear winners on handicap, Buchanan second and Ken Baker also sailing a Solo moving up to third place. With only two races left to complete the series Malcolm Buchanan is set to take first place overall. Warwick Hoddy and John Denyer are firmly on course to take second place in the series with John Purdy well placed to come third.